SORCERER comments: "We have aimed to write an album with diversity and intensity, an album that we want to listen to ourselves. The Crowning Of The Fire King is by far our best recording ever with songs that are strong, powerful and doomy. 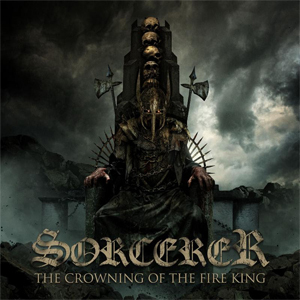 We have captured what SORCERER is about and taken the songs to the next level for the band. With the first single, "Sirens", we really want to show everyone that SORCERER is a force to count on! The video was made by our dear friend Daniel Nyqvist who did the videos for The Dark Tower Of The Sorcerer and Prayers For A King. We all feel that he succeeded to capture the essence of SORCERER with his videos and are proud of what he has done for the band."